In this harmonic mixing guide, Dubspot instructor and contributor to the ‘Mixed in Key’ algorithm, DJ Endo shares his knowledge about an innovative way to mix tracks that are harmonically compatible with each other using software that analyzes your music. Have you ever heard two songs that when mixed together, sounded like they were “meant to be” and went perfectly together from beginning to end, and almost appeared to be singing together? Most likely, the reason these two songs probably sounded so good together is because they are “in key” with one another. A key is the major or minor scale around which a piece of music revolves. For example, a song in the key of C Minor has its harmonic center or “do” at note C and revolves around a minor scale. More and more DJ’s today are mixing “in key” or mixing “harmonically.” Some DJ’s who use harmonic mixing religiously include Armin Van Buuren, BT, David Guetta, DJ Shadow, DJ Skribble, Dubfire, Enferno, Marcus Shulz, Nic Fanciulli, Nick Warren, Paul Oakenfold, Pete Tong, Reid Speed, Roger Sanchez, Saeed Younan, Spor, Tiesto, and many others. In order to mix harmonically, DJs must know the musical keys of all of the records they play. Once they know the key of all their tracks, they can then sort their music collection by key and play tracks that are in the same or complementing keys so that the songs they play will appear to “sing” together. Mixing harmonically allows DJs to have full control over the energy of the room because they can pick keys that boost and lower the energy of the crowd. Not only will harmonic mixing help you choose records that are musically compatible quicker and make your DJ sets flow better, but it will also sonically improve your sound since you are playing tracks that compliment each other. When you mix harmonically, your vocals, melodies, and basslines will be in key, and will blend musically, making your tracks appear to “sing” with one another. Harmonic mixing works for every genre of music from Hip Hop, House, Dubstep to Ambient and Techno. Even wedding DJ’s and Radio DJ’s who don’t mix will benefit from harmonic mixing. Artists and bands who are putting out albums can order their albums by key to sell more records since it keeps their listeners interested and wanting more with each song. Producers can benefit from harmonic mixing because they can figure out the key of all their musical loops and find samples that are in the same key of the track they are making. One thing you might be saying to yourself at this point is “this is all great, but I don’t know anything about music theory.” Well, fear not. Today there is technology that will actually go through your entire music collection and write the musical keys into the metadata of your songs, so you can then view the different keys in Traktor, iTunes, Ableton, Serato or whatever your DJ Program of choice is. The most popular harmonic mixing software is called ‘Mixed In Key.’ This software allows you to analyze all your music folders and label your songs with tags such as Artist, Comments, Title, or Key depending on which field you choose in the Mixed In Key preferences. Mixed In Key also works great for analyzing acapellas, so your mashups are in key. Once you’re done scanning all of your music, there is a simple chart you can follow called the ‘Camelot Wheel’ that will tell you which keys are compatible. The Camelot Wheel lists musical keys that are displayed as ‘hours’ on a clock. For example, 4 o’clock corresponds to 4B or 4A. The ‘B’ letter represents major keys, and the ‘A’ letter represents the minor keys. To follow the chart, you can mix between songs by subtracting one ‘hour’ (-1), adding one ‘hour’ (+1) or staying in the same ‘hour.’ So if you are in the key of ’4A,’ the next song can be 3A, 4A, or 5A. Music theory wise, the Camelot wheel represents the ‘Circle of Fifths.’ The Circle of Fifths shows the relationships among the twelve tones of the chromatic scale, their corresponding key signatures, and their associated relative minor and major keys. This chart is really helpful when composing melodies and harmonies because it helps you figure out notes that work together and sound the most musical. For DJs, it is just a handy chart that will guide you to choose what tracks will go well together better. Below are some examples of key combinations I like to use and how they affect the energy of the crowd. Staying in the same key: (4A – 4A) or (F minor – F minor). These tracks will both be in the same key and are therefore perfectly compatible harmonically. Playing two tracks in the same key will give the effect that the tracks are singing together. Moving up a fifth (+1 on the Camelot Wheel): (4A – 5A) or (F minor – C minor). Playing a fifth up will raise the energy in the room Harmonically these two keys are almost perfectly compatible. Only one note is different between the two scales. Going down a fifth (-1 on the Camelot Wheel): (4A – 3A) or (F minor – B flat minor). I like to say this type of mix will take the crowd deeper. The tracks will sound great together. It won’t raise the energy necessarily but will give your listeners goosebumps! 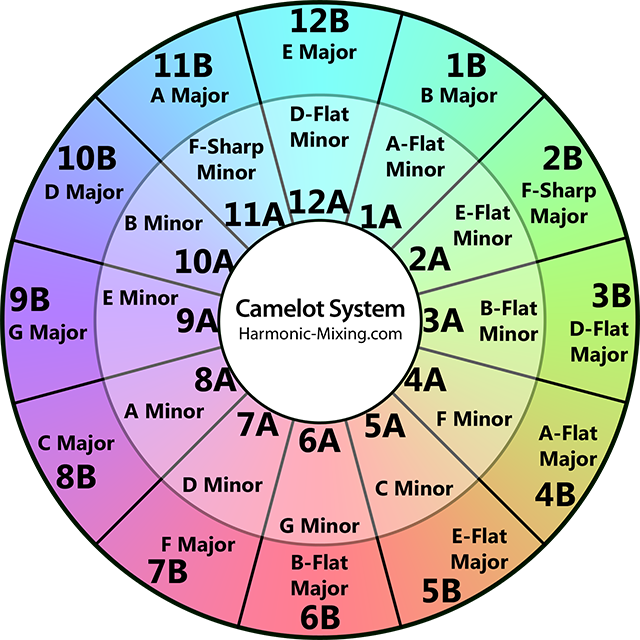 Going from relative minor to relative major (Change letter on the Camelot Wheel): (4A-4B) or (F minor – A flat major). This combination will likely sound good because the notes of both scales are the same, except the root note is different. The energy of the room will change dramatically. Going from minor to major (+3 and change letters on the Camelot Wheel): (4A – 7B) or (F minor – F major). These keys may have three notes that are different. However, the root note is the same and will provide a great musical effect on the dancefloor, either brightening the mood or darkening the mood. Going up a minor third (-3 on the Camelot Wheel): (4A – 1A) or (F minor – A flat minor): While these scales have three notes that are different I’ve found that they still sound good played together and tend to raise the energy of a room. Going up a half step (+7 on the Camelot Wheel): (4A – 11A) or (F minor – F sharp minor). These two scales often don’t have many notes in common, and musically they shouldn’t sound good together. However, I’ve found if you plan it right and mix a percussive outro of one song with a percussive intro of another song, and then slowly bring in the melody this can have an amazing effect musically, raising the energy of the room dramatically. Playing the dominant key of the relative major/minor key (+1 on the Camelot Wheel and change the letter): (4A – 5B or 5B – 4A) or (F minor – Eb major). I’ve found this is the best way to go from major to minor keys or from minor to major keys because the scales only have one note that is different and the combination sounds great. Playing the subdominant key of the relative major/minor key (-1 on the Camelot Wheel and change the letter): (4B – 3A) or (A flat major to B flat minor). This is similar to playing the dominant key of the relative major or minor key and is another great way to transition between major and minor scales since the scales are only different by one note. Plus, it sounds really good harmonically! It is important to note that the Camelot system is a simplified view of harmonic mixing, and assumes that the tracks being played are either at the same BPM or that the DJ is using ‘Key Lock’ or the ‘Master Tempo’ feature found on CDJ’s or other DJ programs. Key Lock and Master Tempo keeps the original key of the track, no matter what tempo is being played. If Key Lock is not on, then every 6% (technically 5.94631%) change in speed will shift the key up a half step. For example, a track in C minor played at 6% will become a C sharp minor. In the past, I would have advised against using key lock because you may lose a lot of bass and high frequencies in your tracks. Also, you may also get unwanted sound artifacts if your tracks are pitched up or down from their original speed. However, recently Traktor Pro and Ableton Live licensed the new Elastique Pro key lock algorithm that sounds amazing. With the new key lock algorithm, it is almost impossible to tell the difference in sound quality when the key lock is on or off. Since this algorithm was released, I rarely turn key lock off when I am DJing in Traktor Pro. Well, the truth is good DJ’s usually CAN mix by ear, but most of the track combinations that work great came from a lot of trial and error, and practicing. Technically speaking, there are 24 possible keys in western music (12 minor and 12 major), and out of the 24 keys, only 6 keys are harmonically compatible with any given key (4 are in perfect harmony, and 2 are in reasonable harmony). Only 25% of all possible choices are harmonically compatible, meaning that if you don’t know the keys of your tracks you are probably going to waste 75% of your time looking for the right track. In the new digital age, we are bombarded with so much music that we don’t have the time to go through every release and figure out what goes well with each other. Using Mixed In Key makes it possible to intelligently and quickly pick tracks that go well together, and will make your music world much smaller, which in this day in age is a good thing. Sure, just because tracks are in key with one another doesn’t mean they will work at that moment, or work at all together. However, you will at least, know what WON’T go well together. I’m not saying by any means to be a slave to harmonic mixing, but it will present you with some great options and combinations of what WILL work harmonically. Then it’s just a matter of picking what tracks fit the vibe, keeps the pace, tells the story, and rocks the house! Check out the other tutorials of DJ Endo’s series on harmonic mixing. Man it’s so nice to give us all these tips, it’s really really useful and I’m glad I found this website. Thank you so much!!! this was ace, it confirmed what I had already found by experimentation – just my music theory is rubbish. @DJ Prince – thank you and much respect! Thanks for this, great article! So according to it, you say 4 keys are always in perfect harmony. For example if I have all my tracks @ 126bpm and the current track is 4a, would the 4 tracks in perfect harmony be 2a, 3a, 4a and 4b? Where would 7b and 1a fall into? Almost perfect harmony (the other 2 keys? ).